New advances in phone technology can provide you with greater capabilities, improve your productivity and lower your cost of operation. As the largest and most knowledgeable Panasonic dealer on the Gulf Coast, we are unequalled in our ability to make the latest technologies work for you. We can often identify significant cost savings by reviewing your local telephone bill, long distance and high-speed Internet services. STC is an Authorized Partner of AT&T, Windstream, and Earthlink. We use these relationships to offer you the best communications network at the best price. We will do this analysis free of charge, with no obligation to you. Whether four phones or four-hundred, a single site or multiple locations, we can provide the ideal system to meet your needs. We are the largest Panasonic dealer on the Gulf Coast. We also provide sales and support for Zultys, Avaya, Nortel, NEC, Executone, Comdial, Vertical, Toshiba, Cisco, 3Com, Polycom, Mitel, & Vodavi. 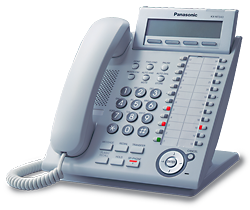 We have many feature-rich yet intuitive options for corded & cordless phones. Click here to learn about some of the more popular options. Do you have a need for personnel to be "freed from their desk" phone, but still be able to handle calls, including transferring calls? No matter how large your facility, we can cover it with cordless service or even turn your cell phones into phone system extensions. Single and Multi-Zone systems allow you to page throughout your warehouse, parking lot, or any large area. We can also install talk-back paging systems, and A/V systems and projectors for your meeting rooms and board rooms. Computer Telephony Integration (CTI) is an integration of the computer (data) and telephone (voice) which can dramatically enhance the way you do business. What is VoIP and do I really need it?